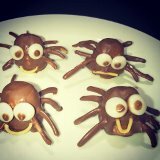 A fun recipe and cooking activity for the kids for Halloween (or any time at all really) is to make Chocolate Spiders. They are so easy to make and so super cute! My boys loved making them AND especially loved eating them! The kids can either help you do this or they can do this all by themselves if you think they are capable to manage this. This activity kept my boys busy for absolutely ages, they were concentrating so hard on it and because it was such a yummy activity they were very engaged and stayed engaged for a long time. It was so yummy snacking as they went, so they not once lost interest in this – not even when they ran out of ingredients!! Then they wouldn’t stop asking me when they would be ready to come out of the fridge to eat, so they didn’t lose interest at all until they had finished eating them all at the end of the week!! 1 x 100g Packet of Chang’s Fried Noodles. 2 Tablespoons of hazelnut spread or peanut butter. 200g cooking chocolate (milk or dark). Lollies or fruit for eyes (M&M’s/Smarties/Sultanas). Ask the children to poke 8 noodles each in to each marshmallow as spider legs. This is good as a counting opportunity for the younger ones. Microwave the chocolate and peanut butter in a microwave safe bowl for about 60 seconds on high, if not melted, put in the microwave again for 5 second intervals. Mix well. Lower spiders in to the chocolate on a spoon until covered. Place the spiders on to baking paper until the chocolate is starting to set but still sticky and not completely set, then stick on eyes (sultanas/chocolate beanies/M&M’s) and a mouth out of a noodle. My boys know that these are a “sometimes” food, in our family we eat very healthy, but do allow treats at times as we believe in teaching our children about the rule: “Everything in moderation”. Children need to learn about eating healthy, nutritious foods and occasionally having a treat, it is about teaching them how to self-regulate and about learning to make the right choices in order to keep themselves healthy. My boys make the right choices most of the time, therefore we do allow them treats as well occasionally, so that sugar is not seen as “forbidden fruit” and therefore more tempting. Hope you enjoy this fun activity, they taste super yummy too and are really fun for Halloween! This entry was posted in Fun for Kids, Holidays and Special Days, Recipes and Meal Planning and tagged Chocolate, chocolate marshmallow spiders, chocolate spiders, fried noodles, fun for kids, Halloween, hazelnut spread, marshmallow, peanut butter. Bookmark the permalink. ← Glow in the Dark Water Beads.